A few years back, the Canadian armed forces ran a recruiting campaign with the enthusiastic slogan “There’s no life like it!” Those words express my feelings about the priesthood, even after nearly thirty years. Daily satisfactions abound, but last weekend I had an experience that tied together three decades of priestly joys. Every year the Archbishop gives awards to two altar servers nominated from each parish in recognition of their dedication. I’ve never been able to attend the celebration at the Cathedral; at first it conflicted with our parish Mass, and in recent years with the diaconate formation weekend. The servers of the year from Christ the Redeemer Parish were Emma, whose quiet faithfulness to serving weekday Masses is exemplary, and Gabriel, who stands out for his particular love of serving and the reverence he shows at Mass. Gabriel attends our parish school, so when I saw him last week I explained why I wouldn’t be there to see him receive the award. He nodded respectfully, but I could see his disappointment, so decided to steal away from the diaconate group and drive back to the city on Saturday morning. After watching proudly as Emma and Gabriel were honoured by Archbishop Miller, I popped in to the reception that followed Mass. As I waited for the group picture to finish, a man came up and greeted me warmly. I recognized him right away as Marty Cayer, a parishioner at my first parish, whom I’d married to Lora, a lovely girl whose family were also very fine parishioners at St. Patrick’s. Marty and I were reminiscing when Gabriel appeared. As I made introductions, I did some hasty math and realized to my astonishment that Marty, now 40, had been exactly Gabriel’s age when he served Mass for me at St. Pat’s with much the same devotion and loyalty. 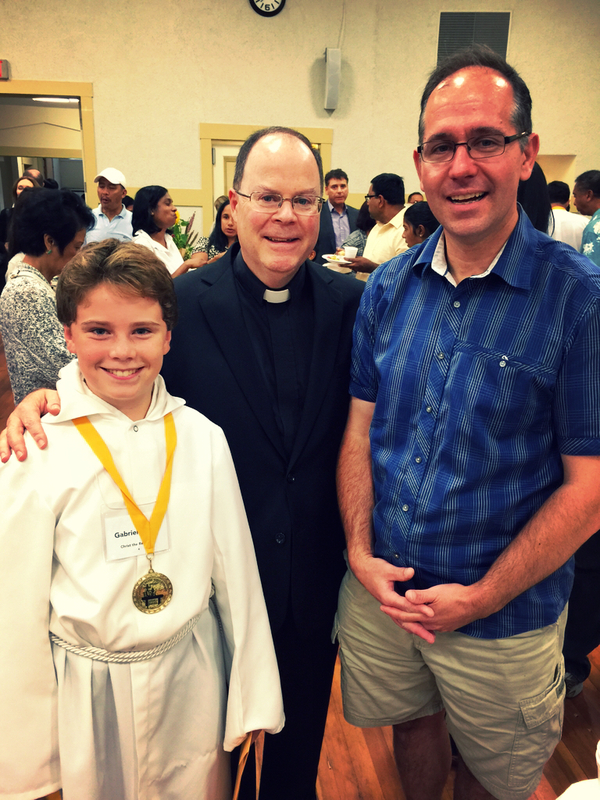 The coincidence—is that really the right word?—hit me with great force, and a wave of emotion came as I tried to explain to young Gabriel what it meant to a priest to stand with two “bookends” embracing three decades of ministry as a priest. I suspect that young parishioners would be very surprised to know just how much we treasure their love and respect for us as priests, and what it means to see them grow as we ourselves age. Life permits me only the occasional meeting with Marty and Lora, but they are part of the fabric of my life. And Marty has contributed one of my favourite memories from the eight happy years I spent at St. Pat’s, a story with which I will end this little reflection. Marty had as much enthusiasm for a solo performance as any 11 year-old boy. But with no hesitation, he pulled back his shoulders and started to sing in a loud clear voice. What carol he sang, I cannot remember. But the moment I will never forget.